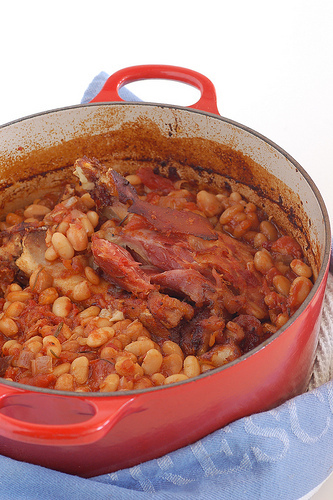 Foodista | Mouthwatering BBQ Baked Beans - Gluten Free! Mouthwatering BBQ Baked Beans - Gluten Free! What's a proper barbecue or cookout without baked beans? Not, I say! While grocery store shelves are lined with cans of baked beans, grilling beans, baked-grilled beans (you get the picture), nothing compares to the homemade version. However, many recipes even use pre-packaged ingredients (liked canned baked beans) as the base for their recipe! While BBQ baked beans are a little on the time consuming side (you have to plan ahead here and soak the beans the night before! ), the mouthwatering smells that will fill your kitchen as it slowly simmers are unbeatable. Even better? This recipe is 100% gluten free, just make sure you use gluten free smoked sausage and a gluten free BBQ sauce.